The holiday that falls on Oct. 31 goes by many names: Halloween. All Hallows. All Saints’ Eve. Samhain. It means many things to many people. Kids and adults dress up as superheroes, monsters, angels and devils, and it’s likely you’ll see several witches among them in pointy hats, with a broom and dressed in all black, with bits of purple. It’s an example of how witches have persisted in memory from ages past to modern times. The witch was a cunning woman on the fringe of society, both revered and hated — from a midwife delivering a child with the help of herbs to a cantankerous old crone being blamed for the death of the neighbor’s cattle. Many innocent people were burned at the stake, hanged, drowned or beheaded for their folk practices or simply because they didn’t fit into society. These women (and sometimes men) weren’t witches, though. Right? They were vilified based on ill-informed superstitions. Is there something to the figure behind the warts, pointy hat, broom and all black garb? Are witches still a thing? You never know — except for that fact that archeologists have found interesting witch bottles hidden in centuries-old homes. From the 16th century to the 19th century, witch bottles were primarily used by common folk to keep away witches and other evils. In the 19th century, glass wine bottles and vials were among the wide variety of witch bottles buried underneath buildings, in boundary walls or up in roof spaces. One bottle was found only a few meters from a Methodist chapel in the U.K.
Interestingly, this bottle was found after 1820, indicating the continuance of “amuletic” traditions, and the bottle was broken before being buried. Typically, witch bottles, a counter-charm to a witch’s spell, were filled with bent nails, human hair, fingernail clippings and urine, for example. Sounds gross, huh? That should keep away unwanted witches or in-laws. These are examples of old folk practices that were very witchy in nature, though these anti-witch bottles were meant to defend people and their homes from spells of ill intent. “Witchy” folk practices survived as people traveled, converted or blended their traditions over time. Today, witch bottles are used similarly for protection, fertility, love and more. Sometimes, they just store herbs. Like the witch bottle tradition, Halloween has also survived. So, What’s Up With Halloween? Halloween itself is said to stem from Celtic harvest festivals, particularly Samhain, which stands for “summer’s end” in Old Irish. It was the most important day in the Gaelic medieval calendar, of four quarter days, and celebrated from Oct. 31 to Nov. 1 in Scotland, Irelands and the Isle of Man. Meanwhile, in Wales and Brittany, the Brittonic Celts celebrated a similar festival, signifying the start of winter. These celebrations marked the start of the dark half of the year (winter) and the end of the harvest. So, it makes sense that this would be a time when the veil between the physical and spiritual realm thins. During Samhain, the spirits were more active and likely to come hang out. Portions of the harvest, meals and drinks were left out for the spirits, and one’s relatives were also likely to visit: Hey, Grandma, sorry about the dust on the shelves. Places would be set at the dinner table: Got homemade buttermilk biscuits for you, though, Grandma. People would even carve faces on turnips to ward away evil — they didn’t have pumpkins, but modern witches do, and chances are you’re friendly with one. Today, there’s a good chance you know a witch and may have one in your family. Like many monotheistic faiths with denominations, there are various polytheistic faiths with various paths, most of which are highly personalized. Some people may be “solitary” while others are members of a legit coven, and get together on the full moon or during special holidays, like Samhain (or Halloween). You may see similar practices as in the old days. Modern witches may build an ancestor altar full of family photos, and pour a cup of wine for Auntie Sylvia (that old hag) and fam. Just like you, they’ll dress up and carve pumpkins, among other rituals — theirs just may include chanting. It’s also a time for divination, but just because someone reads Tarot doesn’t mean that they self-identify as a witch. You’ve likely also heard the term “pagan,” but not all pagans are witches (not that into the spell thing, etc.). Paganism is about the reverence of nature, as an earth-centric faith, in and all around you. The word “pagan” is Latin and means “country dweller.” It has been used as a derogatory term to separate monotheistic believers of one God from everyone else, no matter if they’re Buddhist, Atheist or a witch. If a friend confides their beliefs or practices to you, count yourself lucky to be so trustworthy. Don’t go blabbing around that you know a real live witch. Some people practice privately, because that’s their preference, but also because witchcraft is still a heavy term and looked down upon because of negative stereotypes. Witches face discrimination, and in some parts of the world, are still killed for their beliefs. Not all witches are women, either. Some are men, and some are non-binary. By the way, speaking of brooms, it’s called a besom. Witches use the besom to sweep out negativity and bless, cleaning house on a physical and spiritual level. Yes, sometimes they also jump over them at weddings. You may recognize this quote from Sally Owens in the nineties movie Practical Magic, and it’s one time that pop culture gets something right about witchcraft: There’s no devil in it. Most witches don’t believe in the devil, though there are legends and lore that have creatures with horns that may be mischievous. Witches DO NOT worship the devil. Witches do typically come together in a circle to practice their rituals, but it can be at any time of the day. Most rituals still take place at sundown on holidays, in the spirit of old folk beliefs. Witches wear pointy hats and cloaks and love to give a good cackle. So that you know, witches love crystals. Also, a word of warning, don’t touch a witch’s altar without permission. It’s sacred, y’all. Wanna talk about how witchcraft is a sin? They’ve got you covered and will gladly quote the Bible back to you. Witches do their research and love learning about other faiths from the faith’s respective holy texts along with additional sources from science and archaeology. Many witches who have performed a dedication ritual to a particular god or goddess, or whatever felt right to them, have a monotheistic background where conversion was highly encouraged or required. Witches aren’t going to convert you. They know how awful it feels and how trusting one’s heart is important in the craft, faith and life. Some witches are definitely into the Halloween stereotypic witch craze and go all out with the Halloween decorations, stocking up for decorations for the rest of the year. Shiny bottles and cauldrons abound. Plus, what witch doesn’t love a good sign that says “The Witch is In?” Get the goodies while you can, witches! While they may wear cloaks during rituals, witches wear jeans, t-shirts and hats like the rest of society. You may want to take a walk in their shoes sometime to get to know them. Witches have jobs, families and a favorite sports team. Some have multiple partners, and others don’t, choosing polyamory, monogamy or something in between. They may wear a pentacle or triquetra to represent the elements of nature or their path, for example, just as a Christian wears a cross. Witches are “normal,” too. What’s normal, anyway? But remember, all witches are Pagans, but not all pagans are witches. Not all witches identify as being a Druid, Heathen or Wiccan, either. There are many paths. Just because someone can put a spell on you doesn’t mean that’s their practice. Maybe they just revere Mama Nature, okay? 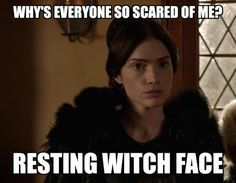 So, if you start making the wrong assumptions about a witch to her (or his) face, you’ll probably be met with resting witch face. It’s totally a thing. So, witches are still a thing, and one may be giving you the side eye right now, as she (or he) reads your aura, wearing overalls and a pointy hat — because why not? Blessed be, witches. Oh my gosh! I love that you blogged about this! Witches and witchcraft actually have a fascinating (and shocking) story in history, but these facts and events have conveniently been left out of history books and modern religions. Recovering these stories and events are SO IMPORTANT though. It’s not just about pagan rituals and witchcraft. It’s about the history of women. And this history is STILL impacting women of today. If you’d like to learn more about this, I HIGHLY recommend reading the book Witch by Lisa Lister. It’s time women got to know their roots and they understood the ideas and pressure on today’s women and where they came from. It’s powerful stuff! Knowledge is power! This was a great post, very informative and unbiased. 1. Not all witches are pagan. Secular, Christian, and even Atheist witches are a thing. 2. Some Witches DO worship Satan. Satanic witchcraft is also a very valid practice. Well, thank you for the feedback, Mykki!! I do my best to inform without bias – especially when it comes to something like this. I’m clearly not a practicing witch or pagan – so thank you for bringing those two points to my attention! I’ve always been incredibly interested in the subject and appreciate you taking the time to educate me even more!